Even though I don’t have a Nia class on two of the days I post sometimes it is still a challenge to get my post up. Other things need to be done. Anyway . 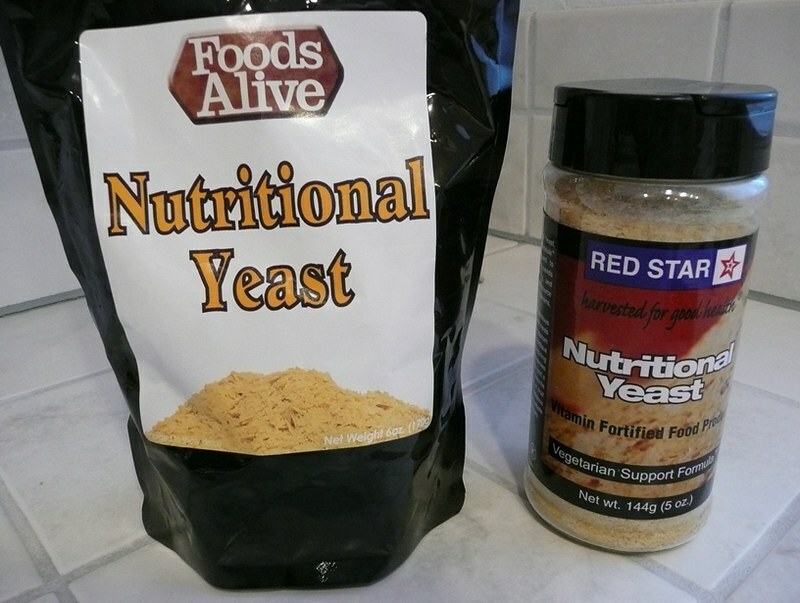 . . .way back in February I posted about Nutritional Yeast. I can’t remember if I had ordered some at the time of writing that or if I was about too. I do know that it was in the month of February that I ordered it because I never received it. One day I heard the delivery person ring the door bell and by the time I got downstairs he was gone. I also hadn’t heard the “thump” of a package being dropped over the fence, but I looked for a package or a note. I looked in the bushes in front of the fence. I looked in the area behind the fence. I found nothing. The reason I know that I ordered it in February is because just this past weekend (May) my husband found a package in the bushes. The delivery person HAD to have HURLED the box over the fence for it to have ended up where it did. I have never had a package end up that far behind the fence so I never even thought to look behind those bushes. AND the only reason my husband found it is because he cut the bushes down severely. So I went looking for the e-mails in regards to the non-delivered package and it was from February. It is funny too because – just within the past two weeks – I decided to buy some Nutritional Yeast from another source. I have been using it. I wanted to give you guys and update on MY experience with Nutritional Yeast. I have been putting it on a lot of things. The package says, “Sprinkle some on hot popcorn, garlic bread, add a spoonful to cereals, juices, smoothies, or use as a seasoning for salad, soup, gravy, casseroles, and so much more.” Well, I kinda see how people think of it as cheesy. It does taste cheesy to me, so my first thought was, “I don’t want cheese in my juice.” I still think that is weird, BUT . . . I also have a feeling the flavor might be influenced a little bit by what it is added to, so it might add a rich woody flavor to juice. 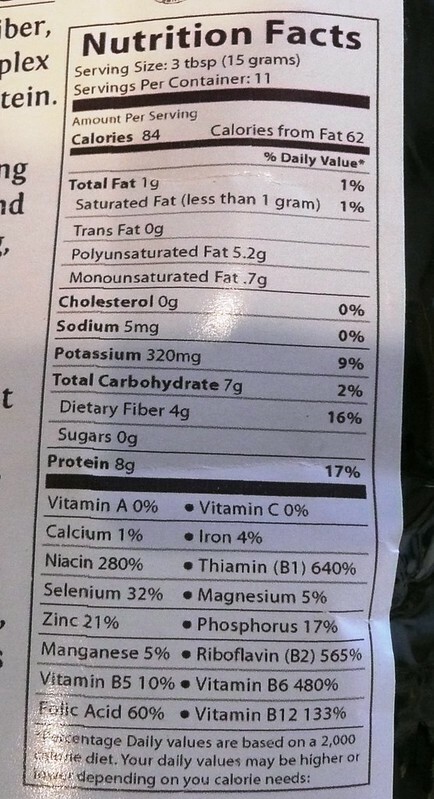 One thing I find interesting is the information on the nutrition labels. Both have almost the same calories 80 vs. 70. Both have the same amount of fat. Both have the same amount of cholesterol. One has almost half the sodium as the other. Both have the same amount of potassium. The difference in carbohydrates is minimal. Protein is the same. What is interesting is the serving size. In one you get 1 gram of fat and 8 grams of protein in 3 tablespoons, in the other it is 1 and a half tablespoons. HALF the size as the other serving size. Hmmm. I guess in this case it is better to judge based off GRAMS and not teaspoons. I don’t want to open the one I just received yet. I think it will last longer if I don’t open it. I would like to know if they taste the same so I am going to wait until I am almost done with the first one before I open the second one. I have been using it a lot. At first I barely used any because I didn’t know what it would taste like. But I rather like the taste to what I have used it in so far. It adds a cheesy flavor to me. So I have been using it in things that I have already used cheese in or in things I would like to use cheese in. I think it makes cheesy things cheesier and helps have the flavor of cheese without the cheese. For instance I put some one our pita bread pizza the other night with some low fat ricotta. Ricotta does not really have a flavor, but the Nutritional Yeast added the cheddar type flavor. I have been putting it on my salads. I like it. I would recommend it to people who what to try something new. I like it because it adds more protein to my diet and I think I need more protein because I am not the biggest meat-eater. I have a friend who commented on the last post that she does use it. I have another friend that said she wanted to try it. What about you? Have you tried it? What do you use it in? This entry was posted on May 22, 2012 at 10:42 pm	and is filed under Food. Tagged: cheese flavor, cheesy, cholesterol, Nia, Nia class, nut flavor, Nutritional yeast, protein, ricotta. You can follow any responses to this entry through the RSS 2.0 feed. You can leave a response, or trackback from your own site.